How Does Your Salary Compare to the Living Wage? In my posts on saving for retirement last week I threw the term “living wage” around a few times. While I encouraged graduate students to save for retirement, I didn’t think that should apply to students being paid below a living wage. 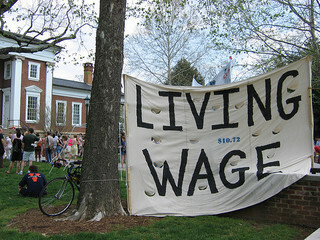 But what exactly is a living wage and how to you determine what it is for where you live? Jacob at My Personal Finance Journey linked to a living wage calculator that I used to look up the living wages for the two places I’ve lived since I’ve been paying my own bills. For Durham, the annual living wage for one adult is given as $19,316 and for two adults $29,133. Our stipends were about 25% above the single-adult living wage and together are about 75% above the two-adult living wage. Here are two plots of the monthly spending in dollars expected by the living wage calculation vs. ours. I added a “savings” category to make the “other” category reflect spending and giving only, but I guess the living wage calculation doesn’t include savings. 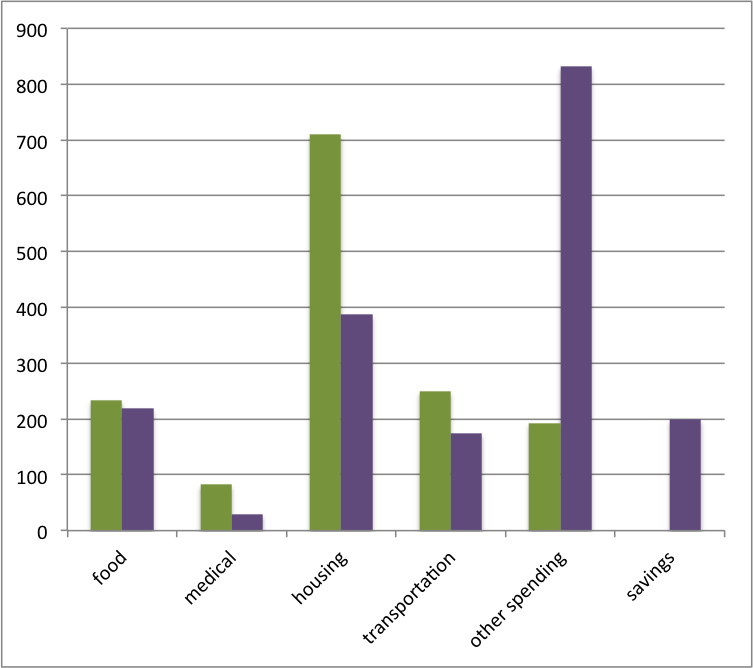 The one-adult reference spending is in green and my spending from 2009 (the last full year I was single) is in purple. 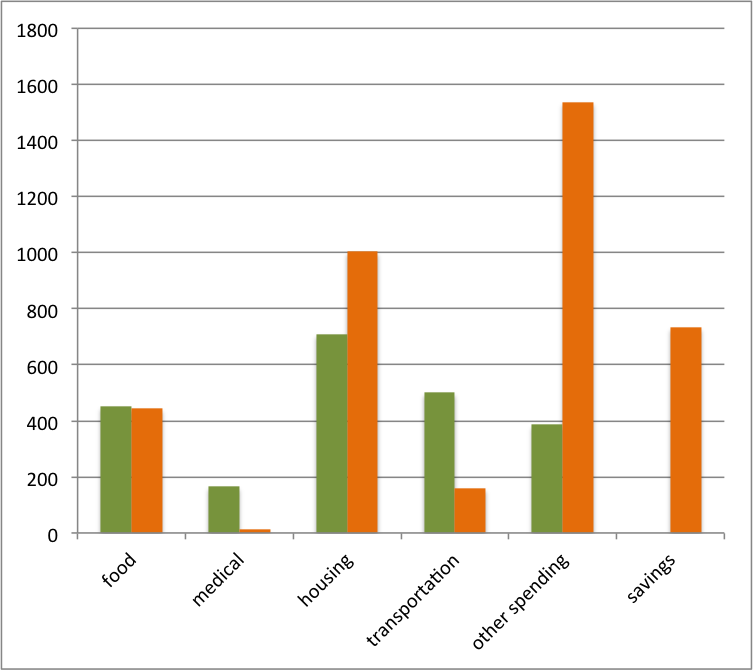 The two-adult reference spending is in green and our current budget is in orange. I just included rent in “housing” although perhaps utilities should have been in there as well. What jumps out to me is that the per-capita expected spending stays exactly the same between the single-adult and two-adult households in all categories (so no economies of scale) except for “housing.” The housing spending in both cases is $710, which from what I know of the Durham market is a low-priced one-bedroom apartment. When Kyle and I lived apart we each lived in 2BR apartments with roommates, so our housing cost did not drop after we got married. In this area the living wage calculation expects two to live more cheaply than one, but for us one can live more cheaply than they expected. We’re right in line with the living wage food category (for us that’s groceries, eating out, and our CSA subscription) and lower on medical costs (we don’t pay premiums for our health insurance). The big drop in transportation spending between me alone and our married budget is consolidating to one car. So I think I was incorrect in saying that graduate students should be able to save 10% if they are being paid a living wage. I think in Durham one’s cost of living can be quite a bit lower than what the living wage assumes, but there are also a lot of other fairly necessary costs that would all have to be covered in the “other” $193 like utilities, clothing, travel, entertainment, and gifts, which I think is unrealistic. Also, the individual wouldn’t have room to be paying off debt, except perhaps a small amount of car debt. To fit in another 10% to retirement savings (and 10% to giving), the individual would have to really set himself up for low-cost living (sharing a house or apartment, paid-for car, bare-bones entertainment) and that’s not realistic for everyone. Glancing at the living wage calculation and my budget from Montgomery County Maryland, I see that I was being paid about 5% less than the living wage but my housing costs were less than 50% of what they accounted for in the calculation, so that’s where I was able to find my 10% to save for retirement. I’m not sure why these calculators think that someone making that little money would live without roommates. If you are earning a low salary, I encourage you to look up the living wage breakdown in these various categories and see how your spending compares. This also might help people with higher salaries create a stripped-down emergency budget in case of job loss. How does your salary compare to the living wage in your area? (I am particularly interested in hearing from graduate students!) Do you think the estimates are high, low, or just right? If you are being paid above the living wage but not saving for retirement, why not? What Do You Consider a Good Salary? 26 Responses to "How Does Your Salary Compare to the Living Wage?" I’m Canadian, so my city isn’t on there, but I’d guess it’s pretty high; at least 40K (Vancouver is extremely expensive to live in). Daisy recently posted..I Got The Job! For my area, my single income is very, very close to the single person living wage for my area according to that site, and my married income is around 30% more than the two person. However, between the two estimates, the only thing that changes is for housing – based on local prices, it assumes that as a single person you’re renting a relatively cheap and small one bedroom apartment, and as part of a couple, you’re still doing that. We both went from living with multiple roommates to a slightly larger and more expensive one bedroom, so our rents stayed pretty much the same per person. Like you, I don’t get the assumption that single people don’t have roommates, I think half the people I know do! The food estimate is accurate, as graduate students we save a tiny bit on medical, and we can spend a good deal less on daily transportation (one used, paid off car), but utilities make up that difference. The “other” category, which I assume goes for entertainment/clothing/savings/gifts/loan repayment/charity/anything else, is a little under 12% of the single living wage, or 15% of the joint, which is not much. So we apparently make 30% above the “living wage,” but due to our apartment not being the tiniest and cheapest on the market, and the proliferation of “other” costs – close friends’ weddings that aren’t too far away, replacing worn out shoes, husband’s undergrad loan repayment, etc. – finding 10% for charity and 10% for retirement has not yet happened. It’s more like 13% for both combined. Oh well…we’ll see what we can do $10 at a time. The sad thing is realizing that between this link and looking up median household incomes for our area based on our post last week…the median household income is about 67% above the two person cost of living, and only about 25% above our combined grad student income. This probably has something to do with the city having 3 universities, since our median age and income are both lower than the state figures, but we also have a huge unemployment rate and not a lot of successful industries. It puts into perspective why a lot of families in the US have trouble saving. I also found it very interesting to compare the median income with the living wage for NC and MD. I’m really happy that there are lots of students in this area because I’m sure it proliferates renting options and works to keep rentals reasonably priced. It seems like your spending isn’t out of line with the living wage estimates except for the housing piece, so at least you have that benchmark of knowing you’re not overspending in those areas. I think the “other” category is quite low though, as you said. You reminded me, I need new sneakers… gotta check the “Appearance” savings account! How are you utilizing found money like gifts, rewards, random side income? Could you commit to throwing that all toward retirement even if your monthly budget doesn’t have room for it? Also, do you have a sufficient emergency fund? Student rentals in my area actually increase the price of housing, weirdly! The university neighborhoods are desirable and have higher rents, further out you can save a little (but the tradeoffs are longer transit time and needing to drive or take public transit to school, the grocery store, etc.) Some grad students do choose to do that, but it isn’t worth it for us. Our apartment is only $75-100/mo more than a significantly smaller, more beat up, or distant apartment, and costs the same or $2-300 less than most of our friends’, so it seemed like a pretty good compromise. In my case, I do tend to put large sums of found money (e.g. tax refunds) toward retirement, which has helped a lot in the past couple of years, but our “married budget” involves putting half toward retirement and around half toward more medium term savings. I tend to spend sums in the $50 range on things like travel, academic books, and clothing. We do have a pretty good emergency fund though, at least 9 months’ worth of living expenses at our current rate. I’ve also saved up almost enough to get through the next two summers without funding…just crossing my fingers that I can get a couple of grants so that we can make it through next year without spending even more than we usually save on anticipated research costs. eek. This is an interesting write-up and it’s pretty awesome that you guys are staying right in line with things. I’m not a graduate student, but I agree with the premise that it’s nearly impossible for a single person to live without having a roommate. It was extremely important for me as I was going through school. I wonder how these living wages were compiled. Was there a consistent application of a formula? Lowest-priced 1BR apt for housing, a certain amount of grocery staples for food, gas prices for car? Or did they actually survey people living around the wage that they ended on to determine what people were spending? The uniform housing cost makes me think the former, but doing the latter for food and car makes a little more sense to me. I know people who live without roommates, but I don’t think they are saving for the future. Given that they assumed the lowest-price 1BR for my area too, I wondered if that was part of a standard formula. Young Professional Finances recently posted..Where Is My Tax Refund? I don’t think you should feel bad about enjoying your higher salary with higher spending. The living wage, like median income, should just be a checkpoint. If you are making reasonable decisions and are balancing spending and saving then you should enjoy the fruits of your labor. It is helpful to know that it is possible in one’s area to live on less, though, in case of job loss or a sudden debt burden. Wow! Don’t hate me, but my wife and I am way above the living wage for our area (Michigan). It’s been about 6 years since I was in grad school – at which point we were probably closer to what they predicted. We’ve been very fortunate to see our income rise substantially over the years through promotions and opportunities. If I were to graph out my spending against what these estimates predict, I think my charts would look a lot like yours Emily. Haha, no hate! I hope to be where you and your wife are in a few years. I think it’s useful to go through this period of having a lower wage (college, for many people, but graduate school for us) so that in the future we can employ conscious spending and keep mindless lifestyle inflation in check. At least, that’s my hope. Have you found that to be true for you? Interesting site. I’d like to know where exactly in NYC you can find an apartment for $1,185 a month (that’s not subsidized/low-income housing) so I can move there;-). You could probably find a closet that 3 people are willing to share with you for that, but you’re definitely not getting your own place for $1,185 unless you live in a really sketchy part of the city (and even then you’d be living in a shoebox). I also think the estimated food costs are far too low, and I can’t even imagine raising a child on their estimates (there’s no way you could get your own place, and you’d definitely be sharing your space with multiple roommates, which might not be ideal for child rearing). Kari@Small Budget Big Dreams recently posted..I Use Credit Cards: I’m Bad! Hmm so maybe based on your observation they are not using a cheap 1BR apartment for the single adult housing. Would someone being paid the living wage they calculated qualify for low-income housing? I would have to check, buy my guess is yes, especially if they have kids. Section 8 is pretty much impossible to get these days in NYC, but I’d imagine if you’re making the “working wage” you’d qualify for subsidized housing and/or the projects (if subsidized housing is available-there are usually huge waiting lists). Kari@Small Budget Big Dreams recently posted..Do You Suffer From Multitask Mania? I am also Canadian and don’t know what our living wage is. I would guess around $20-30K a year. I live in the same town I did when I was in graduate school, so to see the difference is pretty amazing. When I was in grad school, I was making well, well below what is considered living wage but I was able to manage. Now, I make well above living wage (even excluding my husband’s income). What strikes me the most is how little the housing costs change, regardless of family situation. Some of the other costs didn’t make sense to me either; I think I’d like more information at how they arrived at the figures. Thanks for your perspective, Jana. I think we’re all curious about the calculation methodology!